Winter Squash (Roasted Butternut Squash with Maple Pecan Topping) – Grow. Eat. Save. Well, I picked up a smaller squash from the farmer’s market on Thursday (more on that trip on Monday), in large part because I needed a squash to prepare a recipe for this Grow. Eat. $ave. post. You know, since I didn’t have on actually growing in the garden. While I may not have saved on squash this summer, I did contribute in a positive way to our local farmer’s and local community! Enough rambling. Onto the important stuff. And the recipe for the scrumpti-liciousness that you see above. Cut off top and bottom. Scrape out seeds. (Roast them if you want.) Peel and dice. Place the diced squash into a greased glass baking dish (8×8 was big enough for my squash), toss with 2 Tbsp maple syrup. Roast. When it’s done, transfer to a serving bowl. While squash is roasting, run a knife through 1 cup of pecans. 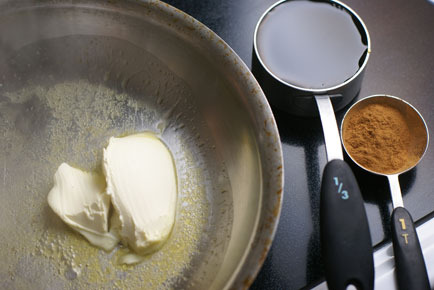 Melt 2 Tbsp butter or (dairy-free) margarine. 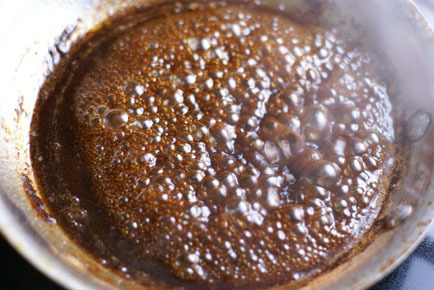 Once almost melted, add the maple syrup. 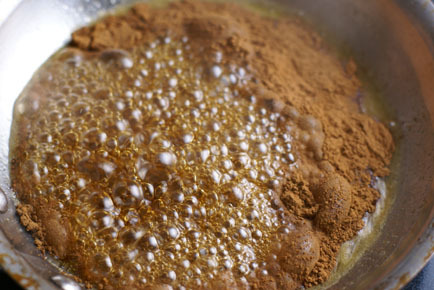 Whisk into a gooey brown goodness. Stir in the chopped pecans. Let simmer for 3-5 minutes. We’re after goo-einess (would someone please spell that for me!?) here. 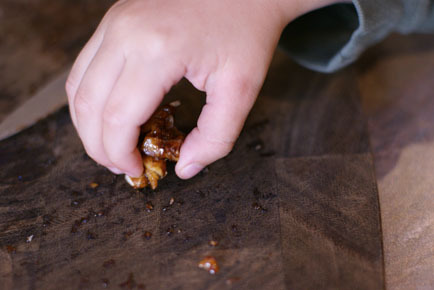 Transfer the gooey pecans to a piece of wax or parchment paper. Let cool and get crunchy. This is the part when we all started snacking. I had a taste. Then another. Then another. Steve came in after work and grabbed a small-ish handful. And Ryan had the last bit after I topped the squash. I ran a knife through the gooey pecans again, before adding them to the top of the roasted butternut squash. Bookmark this one. Print it. Add it to your “Thanksgiving Side Dish” file. Mmmm. Preheat oven to 400. 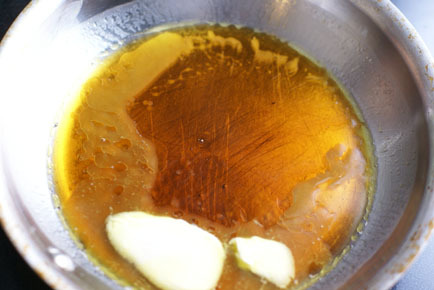 Grease the bottom of a glass baking dish with cooking spray. Peel, seed and dice the squash. Place the squash in the greased baking dish and toss with 2 Tbsp maple syrup. Roast in the preheated oven for 40-45 minutes, or until all squash pieces are fork tender. 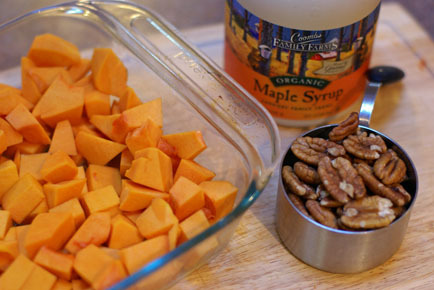 While the squash is roasting, prepare the maple pecan topping. 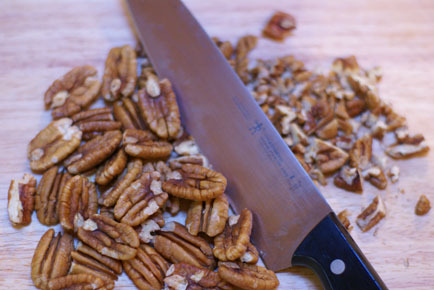 Run a knife through the pecans. Or use chopped pecans. 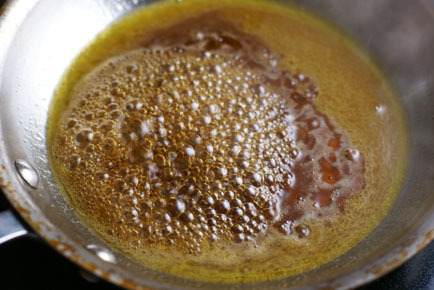 Melt the butter or margarine in a small skillet. Stir in the maple syrup, then stir in the cinnamon. 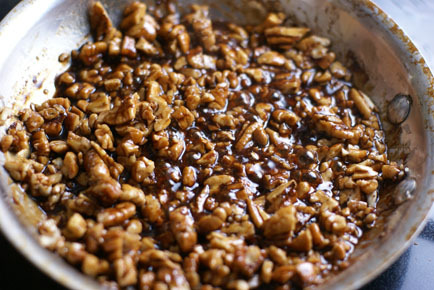 Add the chopped pecans and let simmer for 3-5 minutes. Until ooey-gooey. 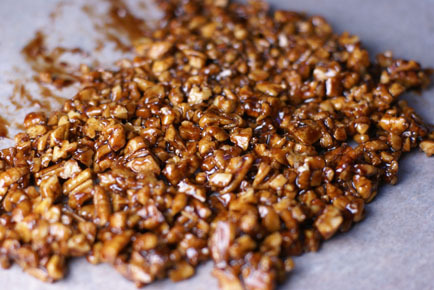 Place the Maple Pecans onto a piece of wax or parchment paper and let cool for 10 minutes, or more. Chop lightly if needed before adding to the roasted squash. 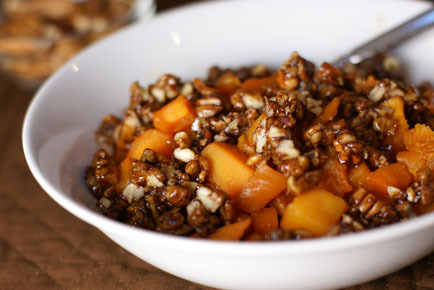 Serve Roasted Butternut Squash with Maple Pecan Topping as a side dish. 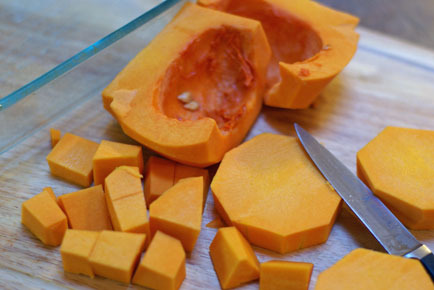 Have a favorite winter squash (acorn, spaghetti, butternut) squash recipe to share?! Feel free to leave a link below or in the comments. how would it have been w/o the nuts? I’m just curious, it looks like the nuts overwhelm the squash. This looks great! I love squash especially the sweet versions! This really looks delicious. I just started eating squash. The sweeter the better! I am literally salivating from this recipe! I’ve just discovered butternut squash this year and I can’t wait to try this dish! I too bought a giant butter squash in the fall at the end of the summer…but how to cut up the 3 foot gigantor. I went to the Ace Hardware store and bought a brand new hack saw for $6.00. It works like a charm. Now the saw is part of my kitchen utensils. It hangs in the pantry and it’s only for cooking. Just wanted to say this is a new favorite for us. I have probably made it a half dozen time since October. The kids ask me to make it for dinner. Yes, they like the nuts. 🙂 But the eat the squash too! Yeah Merrilee! So glad your family enjoys it! Cinnamon pecans are so yummy. I love pecans so much. I bet this recipe is extremely delicious.